Playing games via mobile phones has become a worldwide phenomenon, with predictions that market revenue will overtake console gaming becoming more of a reality as the industry continues to prosper. Significant advancements in mobile and tablet technology has created more scope for the reach of gaming apps across a multitude of genres to be widened, with game developers and phone users benefitting from the ability to turn an innovative concept into a successful title. Independent developers have particularly benefitted from the rise in mobile gaming, as while they may not have the financial muscle and facilities of leading companies, the market is prime for those with clever, illustrated and fun concepts to create games that capture the imagination of its intended audience. Upcoming smartphones in 2016, such as the Apple iPhone 7 and HTC One M10, will provide even greater technical specifications for mobile users to enjoy the best gaming apps at their own convenience. Faster processing speeds, increased screen sizes and higher screen resolutions will only add to the growing number of people who immerse themselves in the mobile gaming industry this year, with the ability to download or access online sites via WiFi and play a wide range of titles. The ability to play poker online on Coral’s website is just one of many additional options available alongside the estimated 1.6 million apps available across the vast download markets, and with smartphones set to take mobile gaming to new heights, there are certain apps that are a must for any handset. Interactive novels may not enjoy the same exposure in the mobile gaming market as action strategy and puzzle games, but having the ability to experience and relive the journey undertook by Phileas Fogg, known for his famous circumnavigation of the world, is one that should not be passed upon. 80 Days provides a wonderful narrative that engages gamers through one man’s ambition to travel via numerous means of transport to many parts of the world. Set is 1872, 80 Days is based upon a 3D map that allows users to create their own global route, with a branching narrative creating a story that is captivating and compelling to read. Inkle Limited receive considerable praise from game critics, with 80 Days awarded TIME Game of 2014 – a high enough accolade to convince mobile gamers to start their own adventure. Poker has transformed into a global sport played around the world, with millions taking to recreational games, casinos and online to meet their need to play cards. The ‘poker boom’ between 2003 and 2006 brought poker, particularly no limit Texas Hold ‘em, to the attention, resulted in the game making the transition from casino floor to the internet, with the subsequent leap to smartphone devices being inevitable, yet necessary and beneficial at the same time. Coral provide smartphone users with the ability to play poker online after a hard day at work or while on the go, with over thirty free tournaments played on a daily basis for poker enthusiasts to play whenever and wherever they like. Downloading the app provides considerable scope to play and enjoy the perks that Coral provide, with daily challenges and a Free Bet Freeroll tournament offering incentives for gamers to not only learn the ropes and enjoy playing cards, but also reap the benefits of being at the table via their smartphone and try to bet or bluff their way to success. Games do not necessarily have to be glamorous and packed with visual qualities to bring it to life, with Dark Echo a fine example of an app that shows perfect execution of a minimalist design. Created by RAC7, Dark Echo is a horror game based upon using visualised sound in an effort to guide and survive through eighty levels which vary in shape and difficulty. Sound is the only difference between life and death as it reveals the environment and enemies that lay ahead, creating the suspense and tension that is expected of any game that comes under the horror genre. It may not contains the gore and graphical detail that many would expect of a horror game, but Dark Echo certainly captures the tension and shock factor that makes it a worthwhile title to have on any smartphone. Guitar Hero has developed a cult following within the console gaming community, with the ability to play guitar or bass on a wide array of popular songs via specially designed controllers branching out to music enthusiasts who want to become rock stars. 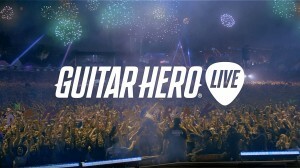 Its transition into a mobile gaming app may not involve the controllers, but the latest smartphone technology incorporates the Guitar Hero Live concept perfectly. Playing notes in accordance with the rhythm of a song via touchscreen is a great option to have to burn off time during long commutes, while the element of skill involved is also a great way to keep the mind stimulated when enjoying lunch breaks at the workplace.